After sunset, there’s no need for your celebrations to end: why not light up the landscape with our beautiful outdoor silver lanterns? The shimmering candlelight will suffuse your surroundings with warmth and provide the perfect backdrop for your party as day turns to night. 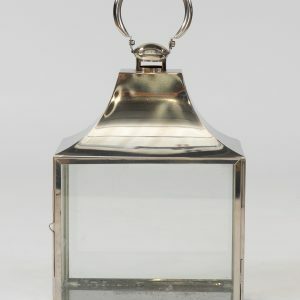 We have three different lantern sizes for hire: medium, square and tall. There’s something about nightfall that’s unforgettably romantic. As the sun goes down, a twilit gathering will be the perfect end to a perfect day, as your guests enjoy drinks outside, illuminated by the glimmer of our lanterns. Practical as well as picturesque, you can use outdoor lanterns to light a path back to the bar, or simply create an enchanting ambience that puts everyone in the mood for love. By hiring some elegant lanterns, you can offer the same classic hospitality, keeping guests comfortable all night long with the radiance from the candle flame. For outdoor gatherings, team our lanterns with a patio heater for the ultimate in outdoor luxury. Keep the home fires burning all night, ready to guide your guests in from the cold. By placing a square lantern outside the door to your venue, you’ll provide a warm welcome to your visitors and help them navigate their way inside. Have the drinks ready to pour as they step over the threshold! Our lanterns aren’t just for summer. In the depths of the dark winter season, your party will take on a cosy, fairy-tale feel with the addition of some traditional-style lanterns hanging from the ceiling, lighting the table or dotted around the room. Give everyone a warm glow as they sip mulled wine surrounded by the soft, intimate light from our lanterns. If you’re putting on a garden party or hosting a summer ball, let the merriment continue for longer against a backdrop of twinkling lights. 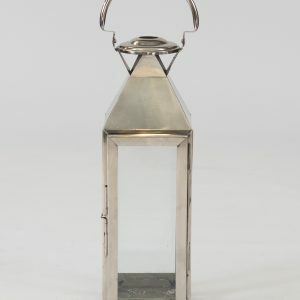 Acting as stylish decorations as well as providing luminosity, our timeless silver lanterns will look great teamed with your garden plants and accessories. So, whatever your venue, these classic pieces will provide effortless style while also acting as a beacon in the darkness. Which lantern size should you choose for your gathering? The answer depends on the layout of your venue, but in our experience, all three lanterns look great together in any configuration. 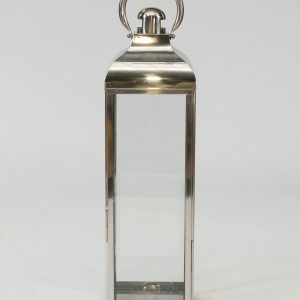 Our tall lanterns are especially suitable for lighting the way along a path, or marking the boundary of a seating area. Square lanterns make excellent centrepieces for your tables, while our medium lanterns are endlessly versatile and will look good anywhere! Why not hire all three and cluster them together in a unique lighting feature?